Cheap flights to Philippines: Manila for €450! China Southern now offers combined tickets to Philippines for good price. 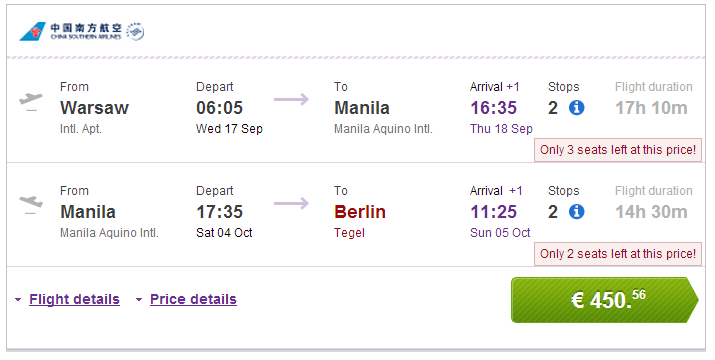 Multicity tickets Warsaw – Manila – Berlin are available for only €450. This trip is aimed at more experienced travelers as there are 2 stopovers in Amsterdam and Guangzhou. Travel dates are from September 2014 until March 2015. Book on BudgetAir to get this awesome price (click on Show extra search options to enter return to Berlin). « MEGA HIT! Super cheap flights to New York for only €255!